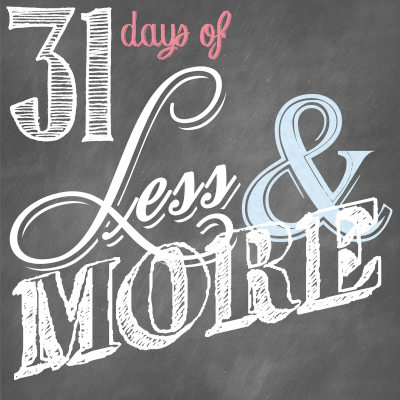 This is Day 25 of our 31 Days of Less & More challenge. To read all the posts in order, start with Day 1, then visit the Overview Page to see the entire series. My husband has a very special term for my overabundance of toiletries. Why do you have so many bottles of junk? Could you please do something with all those bottles of junk? For the love of all that is holy, how many bottles of junk do you really need?! And the truth is, between the makeup and the lotions, the manicure supplies and the 4,000 different hair products, there are more bottles of junk cluttering up my bathroom than I actually know what to do with. And that doesn’t even include the stuff that is actually necessary, like toothpaste and deodorant. I am guessing I am not alone in this bathroom madness. Perhaps it is time to scale it back a little? Find out what you use. Start with a clear counter. Over the course of one week, as you use something, leave it on the counter. At the end of the week, use what is leftover as a starting point for what to get rid of. Eliminate multiples. Do you really need three containers of deodorant or five cans of hairspray? Would one hairbrush be sufficient? Make it your goal to only keep one of each of the products you do need and use. Store the rest in a backup box that you can access when you run out. Discard old or expired products. While expiration dates aren’t everything, hanging on to that lotion you’ve been saving since 2002 probably isn’t necessary. If you haven’t used it up by now, chances are you’re not going to. 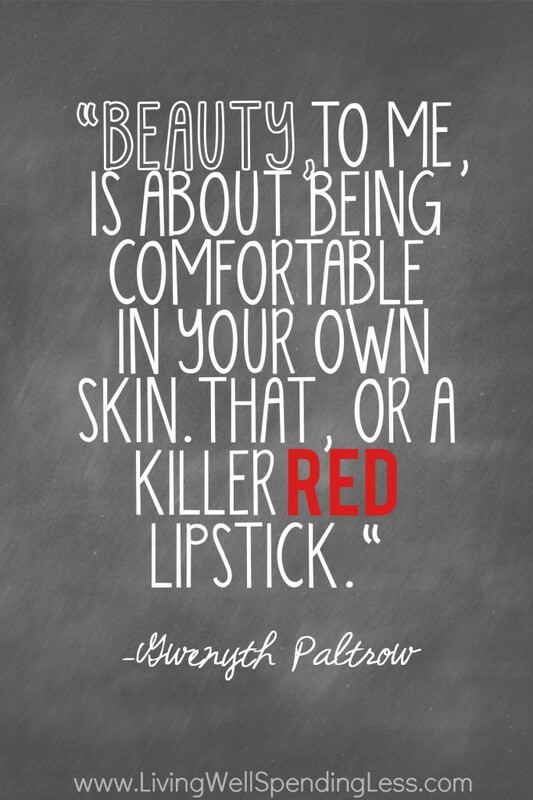 Be sure to read Edie’s corresponding post, More Personal Beauty. Clean out your bathroom. Purge the unnecessary—get rid of stuff you don’t use, duplicates, or items that are past their prime. Find an out-of-the-way place to store the items you might eventually use, then work at creating a simple, organized system to streamline your bathroom routine. Get a printable bathroom cleaning checklist here. Next, think about your best facial feature. Is it your eyes? Your lips? Your hair? What small changes can you make to accentuate your beautiful self? It could be as simple as wearing lipstick or mascara every day, or just vowing to smile more. Are you guilty of collecting too much bathroom junk? What are the products you can’t live without? Ahh…sometimes it helps just to read how to unclutter. I mean, it seems logical to get rid of that CK Eternity lotion I got free when I purchased my bottle of CK Eternity perfume in 2001, but did it occur to me to throw it away? No. And I haven’t worn Eternity since 2006. Thanks for the advice! My bathroom counter and husband thank you too.